Quiet As They Come:If you're like most home aquarium owners, quiet aquarium equipment is important to you. 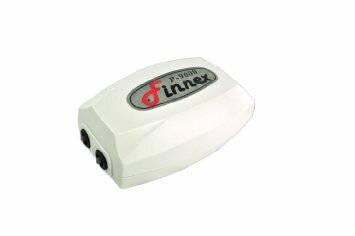 The goal of the innovative design of Finnex air pumps is ultimate operating silence without loss of efficiency! Finnex Air pumps can be used with an under-gravel filter system for increased biological filtration, general aeration and gas exchange and to power underwater ornaments or bubble displays for added enjoyment of your home aquarium.All models are equipped with an overlaying air filter to protect the unit from dust and debris. Finnex air pumps also include rubber legs to eliminate excess noise and to stabilize unit from movement. With the P-9000 model offering flow control, you can use these pumps at your will. The P-9000 also features an electronic air flow control, allowing full range of air flow suiting your desires.